Image is property of Warner Bros, Village Roadshow Pictures, RatPac Entertainment. 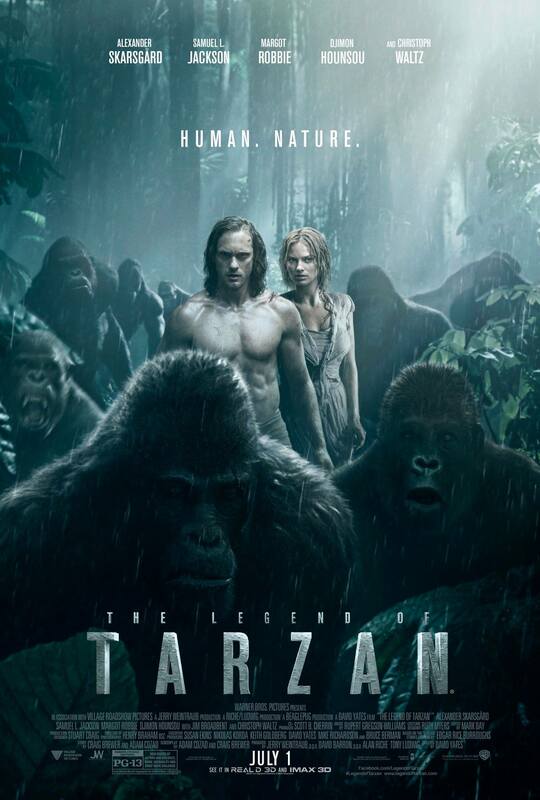 Synopsis: Tarzan, now going under the name John Clayton, lives in London with his wife Jane, until he is forced to return to his roots as plans for a mining colony threaten the wildlife. Review: For many people of the younger generation, their first introduction to the character of Tarzan was Disney’s 1999 animated movie, but he is in fact a character who first appeared in the novel Tarzan of the Apes, which was first published over 100 years ago. He has been represented many times and now director David Yates, famed for his sterling work in bringing the Harry Potter franchise some of its best films, now attempts to give his take on the Lord of Apes for a new generation, and well Tarzan certainly knows how to swing from branch to branch effortlessly, but this retelling of Tarzan’s story does not come out swinging, instead falling somewhat flat on its face after missing its aim. Tarzan has moved on from his jungle days by the time we meet him and has settled down with his wife Jane (Margot Robbie) and living in rather comfortable quarters in London. He is determined to move on, but of course, he is forced to revert to his animal like mannerisms when the area where he was raised comes under attack, principally from Ernest Rom. (Christoph Waltz) So off comes the shirt and Tarzan is reborn! With a director of the quality of David Yates behind the camera, fans of the character must have been optimistic for a solid portrayal of the titular character. There’s no question that Alexander Skarsgard got his physique but his performance is painfully wooden in more than a few places. Naturally you root for him as he’s the protagonist but he’s not exactly a hero to get your blood pumping, in a way that a character like Tarzan very easily could. Margot Robbie gives everything she has as Jane but the script is on the whole a bit weak, with character development being on the scarce side including the main antagonist Rom. Waltz has shown he can be a really compelling villain to watch in the past, but here, not so much as his villain is just bland and uninteresting. The bright spot is by far and away Sam Jackson’s character, as he brings some much needed humour to the story, but it’s not enough to save the movie from its slow, dreary pace. Yates certainly manages to bring some nice visuals to the story here, with some very impressive sweeping shots of the landscape, but these are negated by some less than impressive visuals of the animals. It’s rather obvious that these are CG creations, and it takes you out of the experience, as with today’s technology, it’s very possible to make CG creations look genuine and authentic but its almost as if the production had reached its budget and had to make the CG animals at the last minute. As such, the action scenes, while they are very well handled, certainly do not engage the viewer as much as they could and maybe should. Rupert Gregson Williams’s score is decent enough, but it is not enough to save this latest retelling of the tale of Tarzan from its mediocrity. It is baffling how a quality director like Yates, who gave us some of the best Harry Potter movies, can’t take a character like Tarzan and make him a lot more compelling. Tarzan remains a loved literary figure, yet one can only hope that this retelling of his story is a “Legend” that will be forgotten soon enough. A thoroughly uninteresting retelling for the Lord of the Apes, with a poor script, bland characters and some inexcusably bad CGI, this is certainly not a Legend, in any sense of the word.